Did you take a spin through The Threads of Memory: Spain and the United States (El Hilo de la Memoria: España y los Estados Unidos)? If so, we could use your help. With a little help from Survey Monkey, we’ve devised eight short questions that will help guide us in future exhibits and satisfy some requirements for grants and the like. It’s fast. It’s easy. And it’s a way of doing your part for a museum we know you love. Click here to get started – and thank you from everyone who toiled away on the exhibit. 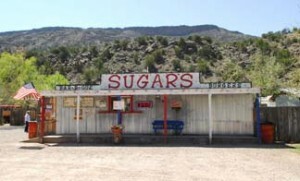 From Pappas Sweet Shop in Raton to Sparky’s in Hatch, the Bibo Bar in Cibola County to Sugar’s BBQ and Hamburgers in Dixon, New Mexico eateries have weathered tough times to tempt the palates of generations. At 2 pm on Sunday, Feb. 13, culinary explorer Cheryl Alters Jamison shares her on-the-road discoveries of places that helped define the tastiest part of our state’s heritage. “Still Cooking: New Mexico’s Historic Diners, Chile Joints, and Burger Bars” is free with admission (Sundays free to NM residents). To jump-start your own gastro-adventure, we’ll share some special deals from some of the state’s longest-serving restaurants. Hit the highway or walk down the street to enjoy New Mexico’s home-style cooking and partake of our historic traditions. During her 30 years in New Mexico, Jamison has eaten from border to border – while taking careful notes. She helped develop and continues to work on the New Mexico Tourism Department’s culinary trails initiatives (the Green Chile Cheeseburger Trail and the Culinary Adventures Trail). With her husband, Bill, she’s a four-time James Beard award-winning author who has written numerous books on food and travel, including the upcoming Tasting New Mexico: 100 Years of New Mexican Cooking (Museum of New Mexico Press, 2012). Jamison teaches at the Santa Fe School of Cooking and appears as a guest instructor nationally and in France’s Dordogne region. She can discuss the finer points of smoking a turkey with Bobby Flay, show Matt Lauer how to make French toast, or argue with anyone about why New Mexican food ranks supreme among regional cooking styles. Throughout the state’s history, New Mexicans have nurtured a love affair with their restaurants. Jamison will pull on heartstrings like the Taco Boxes in Portales and Clovis and reveal which Las Cruces restaurant is famous for its steak fingers and chicken-fried steak (served with green chile, of course). Do you know how Maria’s in Santa Fe got its start? 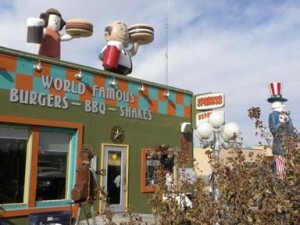 Do you know where in Albuquerque can you get a green chile cheeseburger with egg fu yung? What differentiates New Mexico cooking styles in the north and south? Come to the lecture to find out. Some 20 years ago, when Cheryl and Bill Jamison were writing travel guides, they took on a project that became The Rancho De Chimayó Cookbook. Turning their attention to the serious side of barbecue and grilling, they wrote The Big Book of Outdoor Cooking & Entertaining, Born to Grill, and the landmark Smoke & Spice, which has sold close to 1 million copies. The Jamisons also have played a leading role in the revival of good, robust American cooking with American Home Cooking, A Real American Breakfast, and The Border Cookbook. To write Around the World in 80 Dinners: The Ultimate Culinary Adventure, the couple cashed in 440,000 frequent-flyer miles and spent three months traveling the globe in search of great food. Jamison works as culinary consultant with the New Mexico Tourism Department and the New Mexico History Museum. She also consults on outdoor kitchen design with interior designer Barbara Templeman, through their business insideOUTsantafe. She is a board member of Cooking with Kids, one of the country’s first programs that addressed getting good food into our schools, and was a recipient of the University of Illinois’s alumni achievement award in 2007. Bill Jamison is retired from saving the world and keeps their lives in order from their home in Tesuque. 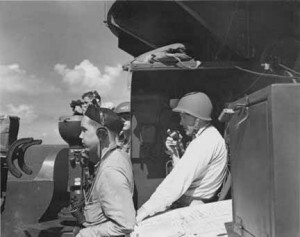 Gunnery personnel aboard the USS New Mexico (1942-45?). US Navy photograph, courtesy of the Palace of the Governors Photo Archives. They were young then, boys, really. Serving aboard what was then the most technologically advanced battleship in the US fleet, they saw some of the worst of World War II – and were there for the final surrender of Japan. On Sunday, Jan. 23, the New Mexico History Museum paid tribute to “the Queen of the Fleet,” and to the men (and, soon, women) who serve on the new USS New Mexico, now fittingly the Navy’s most technologically advanced nuclear submarine. 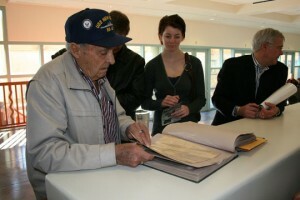 With the opening of A Noble Legacy: The USS New Mexico, 270-some people came to the museum to view the lobby-area installation and hear from dignitaries – among them, George Perez, commander of the submarine USS New Mexico (SSN 779). 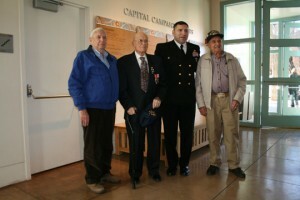 It was a day when the most honored people in the house were men in blue caps. Some of them were balding, some were gray and some were young(ish). 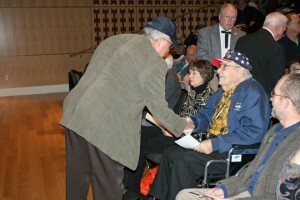 Military bearing was the order of the day, and the phrase, “Thank you for your service,” was heard again and again. Ret. 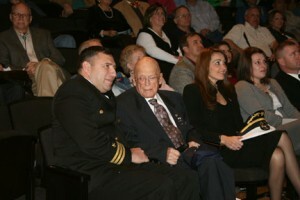 Chief Warrant Officer George Smith, who served on the USS New Mexico (BB 40) battleship in World War II, traveled from his home near Philadelphia to speak during the opening ceremony. 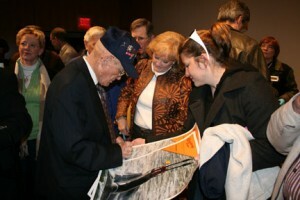 He recounted with humor his efforts to become a submarine man and choked up not only himself but everyone in the auditorium with how closely he came to joining the many men who lost their lives in World War II. The audience gave Smith a standing ovation and, after the event, clustered around him for autographs on posters of the submarine. Cmdr. Perez, his bearing both dignified and genial, regaled the audience with details of his new ship, which is running through trials now and will join the Navy fleet in late 2012. “She is the most powerful warship ever built in the history of the US Navy, probably second only to the BB 40 – which isn’t bad,” he said to laughter. That includes Southwestern-themed curtains that close across the crewmates’ bunks, provided to the ship by members of the Navy League Council of New Mexico, the group that lobbied for five years to have the sub named for the state. Perez and Murphy stayed after the event to speak with visitors, and Perez was clearly charmed by one particular aspect of the installation. Facing walls of a hallway are bedecked with silhouettes of the two ships at 1/20th scale. 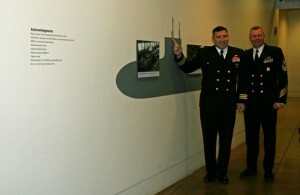 The exhibition’s graphics designer, Natalie Baca, added a last-minute detail to the SSN 779 silhouette: An image of Perez himself taken from a photograph she found on the internet and placed on the submarine to show its scale relative to people. Perez and Murphy proudly posed next to it for family photographs snapped by their wives. A highlight of the installation is a scale model of BB 40 begun 30 years ago by Navy veteran and Albuquerque resident Cecil Whitson. 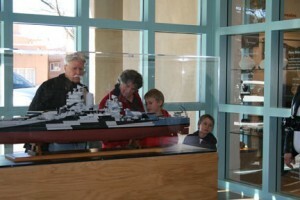 Fellow Navy veteran Keith Liotta and the Albuquerque Scale Modelers Club added final touches after an illness stopped Whitson’s work, and all day, families with children, Navy veterans and model-building aficionados clustered around it, admiring the intricacy of Whitson’s work. Some of the most enthusiastic applause at the opening ceremony was when Levine asked the audience to extend its “collective gratitude” to Whitson. What is included are archival and contemporary photographs of both ships and a video produced by KNME, USS New Mexico BB40: The Drinan Diary. You can catch it by clicking on the link, but the experience of seeing it on the auditorium’s big screen provided the emotional highlight of the day. On Sunday, we also put faces to those stories and were honored to be a place where Navy men and women could make new connections with one another. As a gift to those who continue to serve aboard USS New Mexico, we’ll close this post with a collection of photos to let them virtually attend the event. We wish them calm waters and extend an offer of our own: If you’re ever in Santa Fe, we’ll meet you at The Shed. 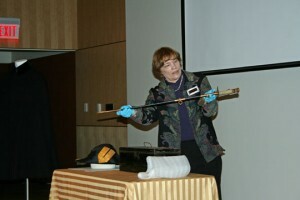 Collections Manager Wanda Edwards with a pre-WW2, sharkskin-handled sword. 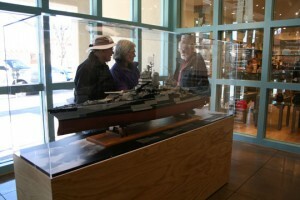 Visitors at Cecil Whitson's model of the BB 40. Cmdr. George Perez and Ret. CWO George Smith at the opening ceremony. Former BB 40 crewmate LaVell Richins shared a scrapbook of his service, brought from his home in Utah. Two Navy veterans make a connection. Young visitors check out parts of a 1920s era uniform worn aboard BB 40. Ret. 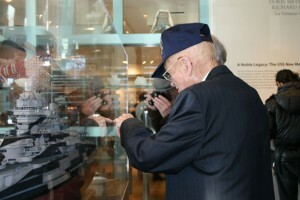 CWO George Smith points to the place on the BB 40 model where he was stationed during WW2. Cmdr. 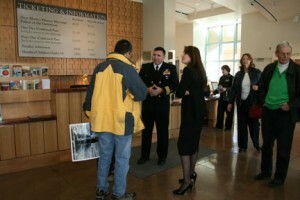 George Perez greets visitors in the New Mexico History Museum lobby. The proud history of the USS New Mexico stands front and center at the New Mexico History Museum Jan. 23-May 9, with a special installation and opening event featuring the ship’s commanding officer. A Noble Legacy: The USS “New Mexico” will be displayed in La Ventana Gallery at the museum’s main entrance with photographs from both the battleship New Mexico (BB-40) and its new, namesake submarine, USS New Mexico (SSN-779). 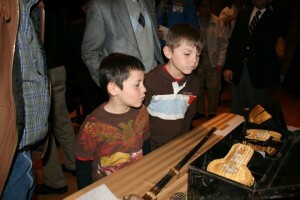 Artifacts from the original ship and a short documentary by KNME-TV about BB-40’s dramatic story will also be included. One of the gems of the show is a scale model of the battleship, begun by former Sandia National Laboratories engineer Cecil Whitson and now being completed by fellow Navy veteran Keith Liotta of Albuquerque. The model is a hand-crafted, 7½-foot replica of the ship’s 1944 incarnation. Every piece on the model was hand-fabricated by Whitson to scale, including the anchor chain and anti-aircraft guns. When it’s completed, Whitson wants to donate it to the History Museum. 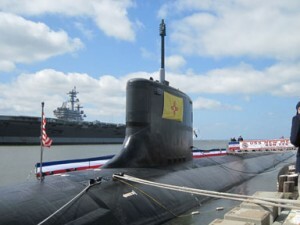 In her prime, the USS New Mexico was known as “the Queen of the Fleet,” and her story still commands respect. From her launch in April 1917 (commissioned in 1918) to the end of her service in 1946, she was the finest battleship of the Pacific fleet. Christened with champagne and the waters of the Río Grande, she carried the name of New Mexico through two world wars, fought in fierce combat, and served as a witness to peace. With the first turbo-electric motor drive, her four propellers allowed her to cruise at 21 knots. She displaced 33,400 tons. Overall, she was 626 feet long and 106 feet wide. Her impressive strength resided in twelve, 14-inch guns, placed on four turrets. She carried 80 anti-aircraft guns as well as sea planes for search and reconnaissance. Assigned in the 1940s to Pearl Harbor, the ship was deployed to protect our eastern seaboard in mid-1941, thus barely missing the attack on the Hawaiian port. In 1945, during the pre-landing bombardment of Luzon, the ship suffered a hit from a kamikaze plane, killing the commanding officer and 29 crewmen. After repairs at Pearl Harbor, the ship sailed to Okinawa for the invasion and, on May 11, was hit by a kamikaze plane and a bomb. The resulting fire killed 54 men and wounded 119; the remaining crewmen continued to fight. On Sept. 2, 1945, the ship and her crew entered Tokyo Bay to witness Japan’s surrender. The ship was decommissioned on July 19, 1946, and sold for scrap the next year. For her World War II service, the ship received six battle stars. One of the Navy’s newest nuclear submarines now carries the name New Mexico and, like her predecessor, she, too, is among the most advanced ships of her class. New Mexico scientists have been instrumental in the development of her nuclear technology. And although her fire power is awesome, perhaps her greatest service is as a silent deterrent to aggression, expressed in her motto, “Defendemos Nuestra Tierra” – We Defend Our Land. 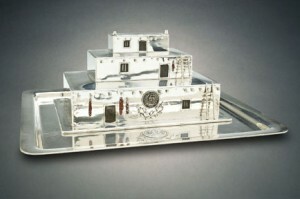 The History Museum’s collections include photographs and documents about BB-40, but the ooh-ah cream of the crop is a 56-piece Tiffany service set, originally commissioned by the state of New Mexico for the ship. 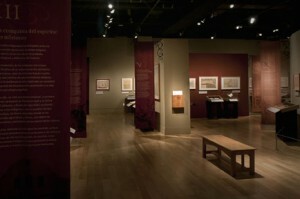 Several of the pieces have been on display in the museum’s main exhibition, Telling New Mexico: Stories from Then and Now. Each piece was handcrafted to reflect different aspects of the state’s cultural heritage, with engravings that detail events like Coronado’s expedition and a humidor in the shape of Taos Pueblo. Strange as it might seem for two deep-ocean ships to be named for a desert state, the fact is, they aren’t alone. Since statehood, New Mexico has lent the names of its cities, towns, tribes, rivers and regions to Navy ships. We’ll close this post with an appropriately military maneuver. Roll call! 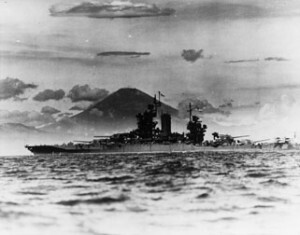 Archival photo, above: USS New Mexico in Tokyo Bay, Japan, shortly after the end of World War II, Mount Fujiyama in background; United States Navy Historical Center. Photo courtesy Palace of the Governors Photo Archives, No. 143237.